MoCA uses your home's coaxial cable network to provide a high-speed reliable Ethernet connection using existing coax cable between your router and a device with an Ethernet port. This device can be an HDTV, computer, game station, wireless extender, or other device, even if it's far away from your router. The MM1000 MoCA Adapter is typically much faster and more reliable than WiFi. 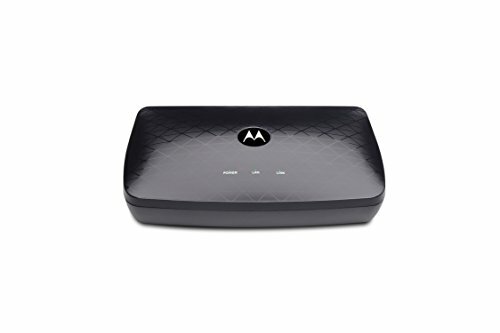 Because MoCA easily handles videos and other high-data traffic over your coax cable, WiFi capacity is freed up and your WiFi devices can enjoy more wireless bandwidth for increased speeds. Bonded 2.0 MoCA is very fast, up to 1,000 Mbps, and works with all types of MoCA including MoCA 1.0, 1.1, 2.0, and 2.5. MoCA shares the coax cable, and does not interfere with your TV or Internet service. You need MoCA capability built into your router or provided to the router by a MoCA Adapter. (Most FiOS routers have MoCA capability, but most other routers and modem/routers need a MoCA Adapter.) You also need a MoCA Adapter for each device you want to connect to the router using MoCA. You can connect up to 16 devices back to your router. The MM1000 MoCA Adapter is easy to install, with simple plug-in connections and no configuration required. A MoCA installation needs a coaxial cable near your router and near any Ethernet-capable device that you want to connect to the router. The MM1000 MoCA Adapter works in coax networks for cable TV, cable Internet, and FiOS or another fiber optic network. It should not be used over a coax cable that's also being used for DirecTV, Dish, or any other type of satellite TV, or with AT&T Internet and AT&T U-Verse networks. MoCA uses a home's coaxial cable wiring to create a fast, reliable Ethernet connection between a router and any device with an Ethernet port. With speeds up to 1,000 Mbps, Bonded MoCA 2.0 beats wireless for speed, latency, reliability, and security. Transmits over the same coax cables as your cable TV or fiber-optic service, with no interference. Does not work with: Direct TV, Dish or other satellite TV, AT&T Internet, and AT&T U-verse coax networks. A Point of Entry (PoE) filter is included to prevent unauthorized access to your MoCA network and protect network security. You need MoCA capability built into your router or provided to the router by a MoCA Adapter. Most FiOS routers have MoCA capability, but most other routers and modem/routers need a MoCA Adapter. You need a MoCA Adapter for each device you want to connect back to the router using MoCA. You can connect up to 16 devices back to your router using MoCA. Easy plug-in setup, with no need for configuring the MoCA Adapter or re-configuring your router. Friendly, professional USA customer support and 2 year warranty.